What happens when I select the book button on a product search? When selecting the book button on Travelbag.co.uk, you will firstly be taken to the payment and confirmation page to finalise your chosen product, here you will enter passenger details, preferred contact details, and means of payment. At this point you are also asked to confirm that you have read and agree to Travelbag.co.uk Term’s & Conditions, and that all passenger details are correct. When selecting the Book button at this point your details will be confirmed or acknowledged depending on your chosen product and you will receive an email with all the booking information included. Our dedicated team at Travelbag will be confirming all of your details, and will be dealing with them accordingly and swiftly in order that you receive your information or tickets as soon as possible. I want to book a holiday online but have never done this before, what do I do? We have a number of ways to allow you to make a booking online with us, as well as the support of the Travelbag shops, at any point you can make a call and one of our staff will gladly help you with a booking. Use of the search form on www.Travelbag.co.uk, is the best way to search for up to date prices if you are looking for Hotels, flights or both. Just select your destinations, departure airports, number of passengers and select "search now" from there. View the products shown and simply select the one you would like to purchase. Don't worry, you don1t have to commit to pay for anything until the last page, which will ask for your payment details. You can make as many searches as you want. If you have specific requirements, we offer to search for specific airlines, direct flights only, multiple room types, and our specialised Multicentre holidays. If you do not wish to use the search form, you can navigate to the destination of your choice by selecting the navigation tabs at the top of the page, Destinations, Flights, Hotels, Tours, Cruise, Car Hire, and Self drive Holidays. These tabs will allow you to view all products we have in those destinations, and preview them before making a booking. At any point you can then opt to use the search form, or telephone our call centre to make further enquiries or make a booking. Travelbag will always recommend purchasing travel insurance prior to Travel, our sales agents can help answer all your questions, and we have a number of insurance options for you to select if you wish to have piece of mind whilst travelling. Please call and one of our travel specialists will discuss your requirements with you. We at Travelbag.co.uk are known for our tailored travel options, Multicentres or twin centres as they are also known, give you the opportunity to experience a number of destinations in one trip. Experience the sights and sounds of foreign cities and cultures then; choose to relax on a beach, national park, or island getaway of your choice. Wherever you have in mind we will have the option for you, the great advantage of a multicentre is they can be tailor made for you, our travel specialists will create a memorable holiday that you will never forget. How do I book a multicentre? Please visit Travelbag.co.uk, select your preferred destination, and choose the Multicentre option, you will find there a number of our products that we have already created featuring favoured destinations and combinations, that have proven success with Travelbag travellers. Not sure about what is on offer, or you wish to create an individual package, then please call one of our specialist agents who will only be too happy to discuss your requirements. What are Low cost & Charter flights? During our Flight or Flight+Hotel search you will have seen our Low Cost or Charter options. 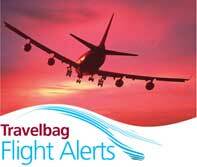 As a travel agent we can offer chartered flights by operators such as Thomas Cook and Thomson. Our Low cost options include such names as Easyjet, Jet2.com and Flybe. We recommend that all documents are sent via registered post/courier service, for an additional fee. If you do not want us to send via this method we will post your travel documents via first class post to the billing address of the party leader. In relevant cases you may also receive Etickets from us, and this will be sent via email to your nominated email account. Travel documents are usually ready for dispatch to you at least two weeks before departure, but cannot be released until we have received full payment in cleared funds. I have tried to search for a holiday only to keep being told no results can be found, why? This happens when no availability has been found for the specific days that you are travelling, this can be due to the flight or hotel no longer having availability. We will however prompt you to call one of our travel specialists, and they will be on hand to address the specifics of your holiday request. What is a 404 page not found? A 404 error page not found, is a response message for a website when a page that you were looking for cannot be found, this can be due to any number of reasons, and is in most cases not your fault. Your computer, Laptop, tablet, or Mobile Phone will be working correctly. More often than not, this page will be active again later that day. Do you have any videos of your hotels that I can view? We currently have a selection of hotel videos on our You tube Channel, and a number of our hotel pages also have videos, we are constantly updating hotel content to provide you with more information with which you can base your decisions on. Can I book my seats? Some airlines allow you to book specific seats at the time of booking, dependant on availability, the online booking process does not currently allow for this, if you have any special requests I.E. such as leg room, then this may be identified in the special requests section when making your booking. Can I check in online and when? An increasing number of airlines offer this service, when you receive your booking voucher please check with the airline’s website to see if online check in is provided. Each airline has different procedures but as a general rule 24hrs in advance. If you have a query on your booking, please contact the relevant department. Pre-Travel - Please contact your personal travel consultant on the details found on your booking confirmation. If you already have a twitter account, you can find us here, if not you can create one when attempting to log in. You can also log in via our pages on the website, each page has a link to our twitter account @travelbag1979, join us there. A facebook account is required, but you can reach us here http://www.facebook.com/TravelbagUK select the LIKE button and join in the conversations. I want to speak to a specialised consultant what do you suggest? One of our strengths at Travelbag is that we have travel specialists that have great experience of the destinations that they are providing flights and hotels in, are specialists are spread throughout our network of call centres and walk in shops across the country. Why do I have to wait in a queue when phoning to make a change to my booking? If you have had to wait to make a change to your booking, we can only apologise. We try to answer all calls in a timely manner. Our after sales team work very hard to ensure that all calls are answered and dealt with in the correct way to ensure that we cater for all your requests, unfortunately sometimes this can be a lengthy process. We recommend avoiding certain times of the day to call. If you require a quicker response, certain times of day are best avoided; the hours around midday are usually busy, as are Monday mornings. Why do I get emails from you? Booking request acknowledged: This email allows us to acknowledge your booking details, and thus begins our processing of your booking. Request a Quote: when asking us for a quote on your travel requirements, you will receive an email from us, confirming your request, and then this is sent on to our specialists for their attention. Request a Brochure: When requesting a brochure, you will receive a confirmation email of your request. Competition entry: We regularly host competitions in line with our travel partners, these are normally published in the press, via our newsletter or through the social networks. Upon entry you will receive notification of your entry via email. Booking confirmation: This email will confirm to you that the elements of your booking have been confirmed, should you fail to receive a confirmation email from us please call us or email us. I want to make changes to my booking how do I carry this out? If any member of your party is prevented from travelling, the person(s) concerned may be able to transfer their place provided we are notified not less than 2 weeks before departure. The request must be made in writing by the party leader to: Customer Relations Manager at Travelbag, SP1/8, Skypark, 8 Elliot Place, Glasgow, G3 8EP. Where a transfer to a person of your choice can be made, all costs and charges incurred by us and/or incurred or imposed by any of our suppliers as a result together with an amendment fee of £50 per person must be paid before the transfer can be affected. For flight inclusive packages, you must pay the charges levied by the airline concerned. As most airlines do not permit name changes after tickets have been issued, you will have to pay the full cost of an alternative flight (if available) if you wish to transfer after tickets have been issued. If you require an alternative flight then we must be notified in writing not less than two days before departure upon which we shall endeavour to secure an alternative flight. I would like to contribute to my friend/family members holiday? We welcome payments from family or friends for those recipients who are travelling with us, we have a number of accepted methods of payment, and we can happily take this payment over the telephone for you, Before you call please have to hand the booking reference, and the name of the consultant who arranged the booking. This information along with the relevant number to call can be found on the booking paperwork provided at the time of sale. What if I want to cancel my holiday/flight/hotel? The following cancellation charges* will be payable where you cancel or your booking is cancelled in accordance with these Booking Conditions (e.g. where you fail to make payment as required) except where otherwise stated. The cancellation charges set out below exclude any amendment charges. Amendment charges and insurance premiums are not refundable in the event of the person(s) to whom they apply cancelling. 100% of total cost of booking. *These cancellation charges apply to all bookings, except where a booking includes items or services where our suppliers' own cancellation charges exceed those shown above. Please enquire at the time of booking as up to 100% cancellation charges may apply from the time of booking. Are a member association designed to give protection to its member body, in order to protect their travelling clients in the ever changing world of travel. By providing schemes of financial protection and a course for redress, ABTA have grown over the last 60 years into a body the travelling public trust, and we are proud to call ourselves members. Our ABTA membership number is 76300 & V0654 and you can find our member page here. What does ATOL mean exactly and why do you need it? We hold an Air Travel Organiser's Licence issued by the Civil Aviation Authority (ATOL number 2959). When you buy an ATOL protected air inclusive holiday from us you will receive a confirmation invoice confirming your arrangements and your protection under our ATOL. In the unlikely event of our insolvency the CAA will ensure that you are not left stranded abroad and will arrange to refund any money you have paid to us for an advance booking. For further information, visit the ATOL website at www.atol.org.uk. Dependant on the airline, you would visit the airlines website, and go to the check in section, you would need to produce your booking reference stated on your paperwork, and follow any on screen instructions. What is an airline PNR? The Passenger Name Record (PNR) is a reference code created to easily identify your travelling itinerary, the PNR is used in our computer reservation system, and allows us to access details of the journey and the party travelling should we need to reference any information. Why do I get a booking request acknowledged? This email is sent to you to allow you to thoroughly check your booking details and to advise you that your booking will have to be checked and finalised before a confirmation can be sent. Should there be any issues with names, dates of birth and travel details please email us immediately as we'll be able to rectify any issues you may have before processing your booking. Please be aware that the Booking Acknowledgment Request email is not a confirmation of your booking and should not be treated as such. Should you fail to receive a Booking Confirmation email please call us or email us. E Ticket is an electronic ticket. This replaces the method of paper tickets, and is widely used by many airlines when travelling. An E ticket will be sent to you via email in various formats. The E ticket will show such information as your E ticket Number, and flight details. This can be printed off but is not necessary for check in. All your details are held electronically to make your travel experience that much easier. Due to environmental impact, in the form of paper use this has become a widely used from of ticketing, and is safe and hassle free. No longer will you have to wait for a ticket in the post, as this is delivered direct to your email account. If you decide to print off your ticket, and lose it, you can simply go online and print off another for your travel or reference. If changes are made to your itinerary, then this will also be updated by E-ticket, and no need to wait for possible delays in reissue of the ticket. What if I lose my E-ticket? If you should be unfortunate to lose or delete your E ticket before you travel, please contact your sales representative and we will gladly send you an email containing the E ticket information, alternatively if you have recorded the reference this will normally allow you to check in. When booking online you are required to pay in full. Visa Credit, Debit and Mastercard are accepted. Also, your card must be registered to a UK address as foreign cards are not accepted online under any circumstances. If you would prefer to pay for your holiday via one of our Sales consultants then please feel free to contact one of our travel specialists listed in the Contacting us section, Our call centres will happily arrange your request and accept payment from all of the major credit and debit cards, along with cash and/or cheque payments. Travelbag also has a number of Travel Shops located around the UK, each one of these can accept payment from all the major credit and debit cards, along with cash and/or cheque payments. Find a Travelbag shop. I would like to contribute to my friend/family members holiday. What do I need to check in at the airport? Depending on where you are travelling to, you may need different items, but at the Check in desk, a standard check list will ensure your time at the departures is stress free. Luggage allowance varies depending on the airline and destination to which you are travelling; this could also vary on the flight class that you have booked. Your confirmation email will detail the weight limit and amount of luggage accepted for your destination and the airline you are travelling with. Please be aware that extra cost could be incurred with the airline if you exceed this limit. Please verify your limit before travelling if you have any queries. As per Hold luggage, the limit varies airline to airline, although aswell as weight; a size restriction is normally applied with most airlines due to limited overhead cabin space. In all cases please consult the airline you are travelling with to discuss your individual requirements. Do your sales agents visit the hotels they are selling? Travelbag sales specialists regularly carry out educational visits to the destinations that they specialise in, we also have land product managers who are responsible for the relationships between us and our hotel suppliers. What if I have a problem with my Booking?